The words “wild hunt” lead to an immediate, instinctive reaction, even to people who’ve never played Witcher 3 or read the Eddas. In a distant corner of our minds, there seems to be an ancestral memory of snowy, menacing forests prowled by wolves, and it never entirely goes away, even when we’re playing Magic. Master of the Wild Hunt here is pretty straightforward, and potentially very powerful: given enough time, there are almost no creatures you can’t hunt down with his ability. It’s even an activated ability and not an instant, so it works on Emrakul the Promised End! The wrinkle, of course, is that it takes a long time to get that kind of mass of wolf tokens if you’re just relying on his upkeep trigger, and that ability is so threatening that people will be gunning for him. Fortunately, you’ll notice that it counts any wolf you control, and not just his own: Wolfir Silverheart and Howl of the Night Pack are good by themselves and even better alongside the Master. I remember before Innistrad existed the closest thing we had to werewolves was wolf tribal. Then Master of the Wild Hunt came around and was the card that gave the deck enough juice to be viable. Things only got better with actual lords such as Howlpack Alpha or Immerwolf if you splash red. In Limited continuous free token generation can quickly take over the game. A small problem is that when you activate Master’s ability all your doggos become tapped, leaving you wide open in multiplayer games so use his ability right before your turn. Moonlight Hunt helps mitigate this problem and attaching Raised by Wolves to this card can give it some extra oomph. The green mythics of Masters 25 are an…interesting lot. While I shan’t be talking about the Tree That Shall Not Be Named, Master of the Wild Hunt is quite a bit more interesting. It’s actually also a decent reprint candidate, with a single printing in Magic 2010 and a double-digit price tag before showing up here. 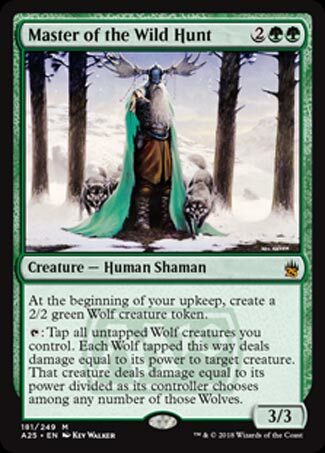 The major synergy for Master of the Wild Hunt is with Wolf tribal. He slowly amasses an army of howling menaces, and then you can command all of them to go for the throat on one unlucky target creature. He effectively has the ability to pick off one creature each turn, which is a very valuable trait for a green creature. He’s definitely the kind of Limited bomb that can run away with a game; while he himself isn’t particularly durable, he never needs to get into the fray to have an impact. And he also pairs well with green’s slew of token-doubling tricks, like Doubling Season and Second Harvest. Master of the Wild Hunt is powerful. I think he’s too slow to see Constructed play, but casual settings will have a field day.